For years the normal way to carry luggage on a cycling tour has been panniers mounted to a rack. That would normally consist of 4 panniers and 2 racks and actually it’s a very good way to carry an average sized touring load. The load is carried low down, around axle height, and can be spread between the panniers so bike balance is not affected. Capacity can be around 70 ltr which is enough for even the most comfort loving tourist. The problem for me with this system is that I rarely carry enough gear, or supplies, to need 4 panniers. 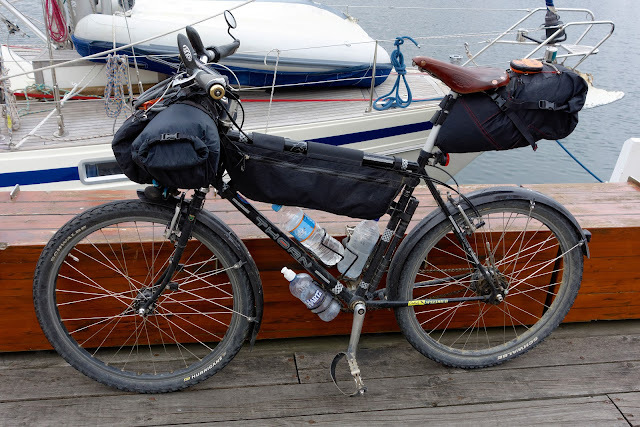 I soon ditched the front 2, and its rack, and carried everything in the rear panniers. I still have ample space but now all that weight is concentrated on the rear of the bike. That can make the front feel very loose, and light, when cycling off-road or on unsealed surfaces. Surely there is a better way of carrying lightweight loads? Turns out there is. Over the last few years off-road touring, or bikepacking, as it’s now called has become more popular and frame bags, rather than panniers, are increasingly the norm here. I liked the idea and fitted out my Thorn touring bike with a set from Revelate Designs for a 2 month tour around Tasmania. 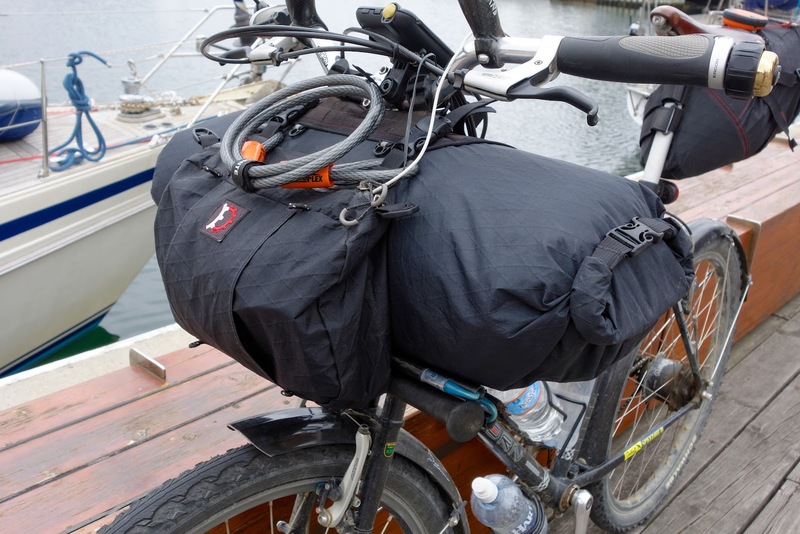 Revelate Designs (formally Epic Designs) is one of the best known manufactures of bikepacking frame bags. They started off making custom one-off bags in a basement but nowadays concentrate on producing a range of styles in only 2 or 3 sizes. The advantage of this system is that waiting times are much lower than with a custom set and prices are very competitive. The disadvantage is that you will never get that perfect fit like you can only get with a custom built bag. 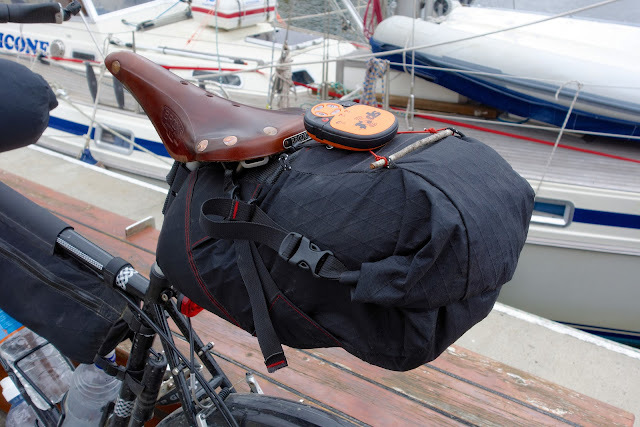 A standard bikepacking luggage system will consist of a seat pack, frame bag and handlebar bag. All these mount directly to the bike, no racks are needed. This immediately saves around 1kg over my standard 2 pannier rack mounted system. Materials are light but tough X-Pac fabrics that I've used to build hiking packs before and really like. After 2 months constant use none of the packs are showing any wear and the seams have held up well. 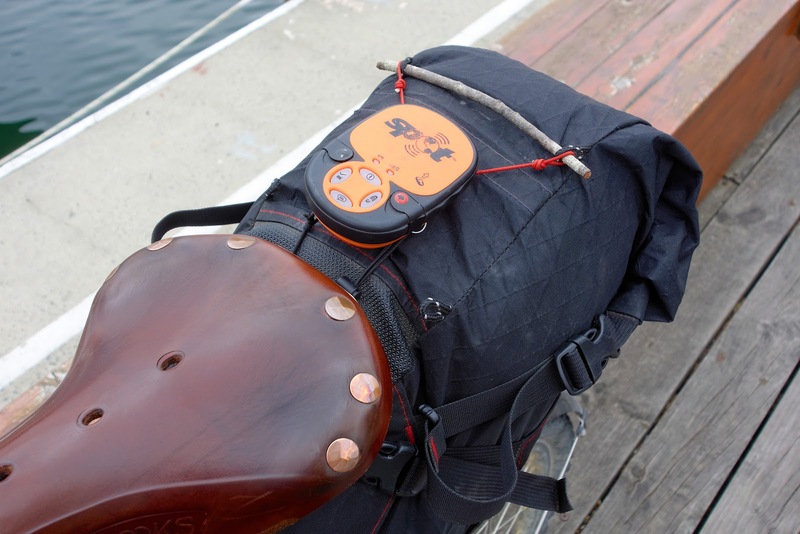 The standard seat pack is the Viscacha which has a measured weight of 398g for $130. Volume is adjustable via the rollover opening for 6-14L and it attaches directly to the seatpost and saddle rail bars. 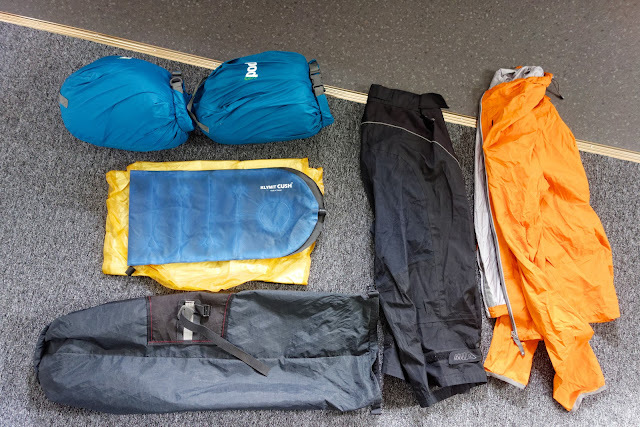 Loading the Viscacha with gear can be tricky because of its shape so needs some thought before packing. I carried most of my camping gear in here along with any bike tools and it’s surprising just how much you can fit into this pack with practice. I always packed the Viscacha off the bike and then fitted it pre-packed to the saddle via the 2 quick release buckles for the seat rails and then to the seat post via 2 velcro straps. Once fitted all the straps can be tightened down and you are left with a reasonably secure load. There is some side to side movement which I thought might affect bike balance at slow speed on rough terrain but honestly I've never noticed it. Internally the pack has a load strap to secure and compress the contents and that worked well. During the day the quick release buckles used for the seat rail attachment would slip and need retightening. Not a huge problem but slightly annoying. The pack also has a very abrasive wear-strip on the inside of the seatpost area that will remove any paint or varnish on your seat post. Coloured, anodised or carbon seatposts will look messy after only a few weeks use and I think titanium would be the perfect seatpost material for use with this pack. It’s just cosmetic damage on my aluminium post but I'm not sure I would fit this to one made from carbon fibre. On top of the pack I was able to mount my SPOT tracker and it always worked perfectly in this location. 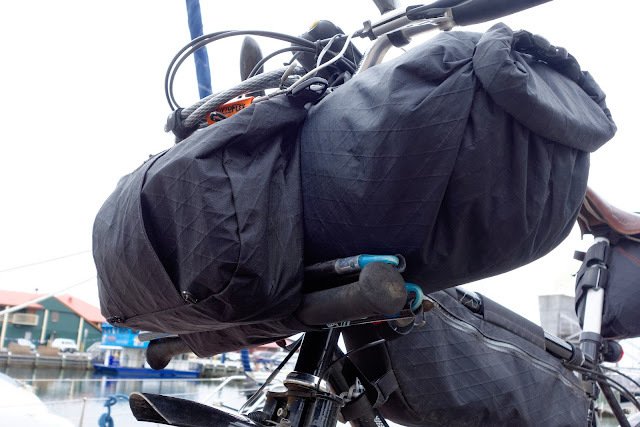 It’s worth noting that the Viscacha has been updated since my version and it now only has 1 velcro strap which they say is even more secure and compatible with a suspension seatpost. Camlock buckles have also been fitted to the rail attachment buckles which should eliminate the slippage problems I experienced. Sounds like some good modifications. The Tangle frame bag ($70) is available in 3 sizes and unusually it only covers the top portion of the frame. This should allow you to still use the bottle mounts but that will depend on your frame. I liked this idea and prefer to carry my water on proper mounts rather than in bags. My bike was able to take the large sized frame bag and this was used to carry the supplies, padlock and charger. Capacity of the large frame bag is quoted at 350cu inches and mine weighs 245g. I found the capacity to be fine for normal touring use. When I had a longer spell between resupply points and loaded it up with 4 days of grocery store bought supplies (not as small as outdoor store bought freeze dried food) then it was only just big enough. My main concern was with the zip and the pressure that it was under when closed. It never failed or caused any problems but if I loaded it like this day after day then I wouldn't expect it to last long. I would say if you are buying specialised dried food from an outdoor store then you can probably cram in up to 6-7 days of food. However, if you are on a tour and buying what’s available then 3-4 days is the maximum for this large sized frame pack. Of course you might be able to pack some additional food elsewhere in your luggage to make up for this. The pack attaches to the frame with a number of velcro straps and cam locked buckles. I fitted it to the frame and just left it there for the tour. It remained secure and never needed adjusting. The pack has 1 big main compartment and a smaller side pocket that are both accessible via waterproof zips. In the smaller compartment I fitted my bike charger and padlock leaving the main compartment for supplies. Again, expect some paint damage where it attaches to the bike frame. It was only minor scuffing in this instance and no paint was actually removed. There is a hole in the main compartment for a hydration pack but I never used it. I really like this pack but find it a bit too small for my needs. I will probably make my own custom pack for future trips that can carry another couple of days standard supplies with ease. If your needs are more modest, or you will be able to buy specialised dried food, and the Tangle fits your frame, then you will be happy with this pack. 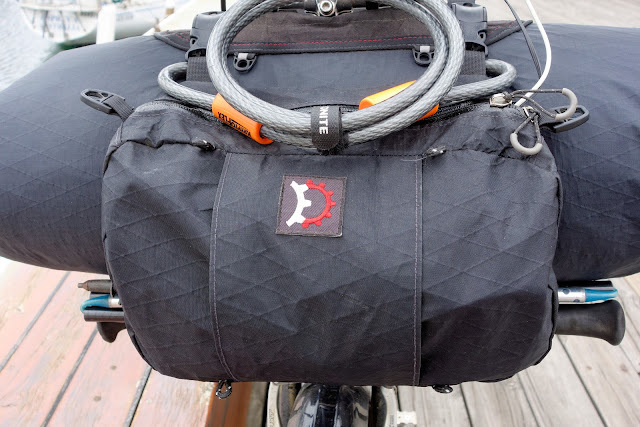 The Sweet Roll ($90) is a handlebar mounted bag that I used to carry all my soft kit. Sleeping bag, therm-a-rest, spare clothing and waterproofs all went in here. It has a quoted capacity of 14L and weighs 265g on my scales. 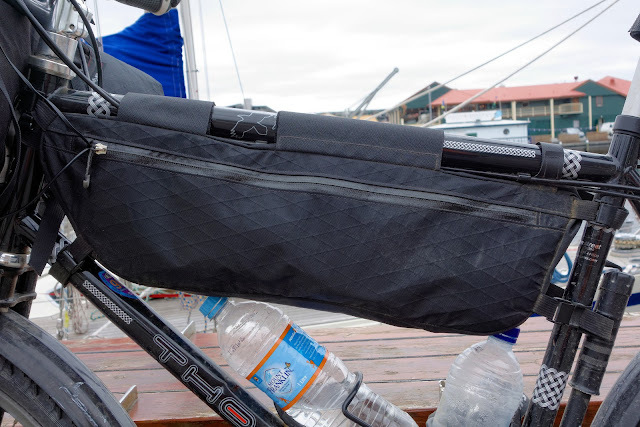 The pack is a simple tube with rollover ends that attaches to your bars via 3 buckles. 2 go around the actual handlebars and the other around the head tube. Rubber spacers are supplied to keep it away from cables and to stop abrasion. A further set of 4 buckles can be used to attach a front pocket or additional straps for attaching other items. Capacity was excellent and it swallowed up all my gear and still had a bit of room left for additional supplies. The pack is sold as waterproof but as with any pack I would still use a waterproof liner, mine certainly let some water in. I would only pack light gear items in here as the mounting isn't totally secure. If you react, and steer quickly, then it takes a fraction of a second for the load to catch up. With a heavy load this is noticeable and slightly disconcerting. Keep the pack well stuffed, and light, and it’s not a problem but load it up with heavy supplies, for instance, and the steering feels strange. Again expect some scuffing at any attachment points to the bike. Depending on your bike it can be a little difficult to fit a Sweet Roll and you might have to be creative with cable routing. My bikes Rohloff shifter cables are right where the bag needs to be so had to be re-routing up and over the handlebars. It all works just fine but looks a bit messy. I really like the Sweat Roll but I now see that they are about to release a new version of the Harness handlebar bag. As it says this is just a harness that you attach you own sacks too. I like this idea and could see it being more useful if you take a packraft, or other bulky gear. My only concern with a heavy packrarft up front would be the steering on rough terrain. Pick what's right for you but the Sweet Roll is an excellent choice. I also have a large sized Front Pocket ($47) that clips into the 4 buckles fitted on the Sweet Roll. I find it to be very useful for storing my valuables and anything else that I might want quick access to while riding on the bike. My hiking poles fit nicely under the lower harness and through the top harness I fit my cable lock. You can also buy a strap that converts it into a "man bag" but I've not tried it. Again this pocket has been slightly updated and now comes with mesh side pockets. Mine weighs 159g. Changing from panniers to frame bags has shaved some useful weight from my bike and drastically improved its handling off-road. I like them and will not be going back to panniers anytime soon unless I needed the extra space. This system has less capacity than even my 2 pannier Ortlieb system so it is only suitable for those that can travel, and pack, light. It also takes much longer to put everything away in the morning because packing is more critical, particularly with the seatpack because of its shape. Personally this is all just a minor inconvenience and if you are thinking of frame bags then have a long hard look at Revelate Designs. A custom frame pack would perhaps fit better than my Tangle, and offer more capacity, but you will likely loose the bottle mounts. Of course it would also cost considerably more. Building gear or out hiking?